The TMJ or jaw is a common area that can become injured or sprained causing jaw pain or ache, face pain, ear pain, neck pain or headaches. This commonly occurs due to clenching or grinding (bruxing) of the teeth due to stress. Continual grinding and clenching causes spasm and pain in the muscles that close the jaw and may cause inflammation of other associated structures around the jaw joint. TMJ problems are sometimes a result of dental work where the mouth is stretched open for an extended period. This may lead to the disc being pulled out of place by one of the muscles (lateral pterygoid) that attach to it and result in a “clicky” jaw. 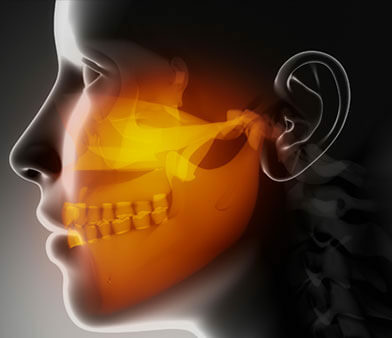 TMJ problems can also result from trauma such a punch to the jaw or face or impact from an accident. This can result in a fracture or dislocation of the jaw bone or damage to the cartilage disc inside the joint. Jaw pain is common and occurs at any age. It is more usually experienced by individuals who have a high degree of stress and who clench and grind their teeth. Jaw pain is also often encountered in sports such as boxing where a higher incidence of blows to the face occurs.